Before you unwrap that inexpensive chocolate you bought at the check out counter today, or prior to sipping on some hot cocoa or that sublime brownie, ask yourself where the chocolate came from, beyond the store shelf. As a consumer of a commodity that is rampant with exploitation, it is imperative that you connect your consumption choice to the source and understand how it was made. Remember, you vote with your dollar, through every purchase. And if chocolate is something you purchase often, I implore you to dig deeper into why you should care to know where the cocoa came from. 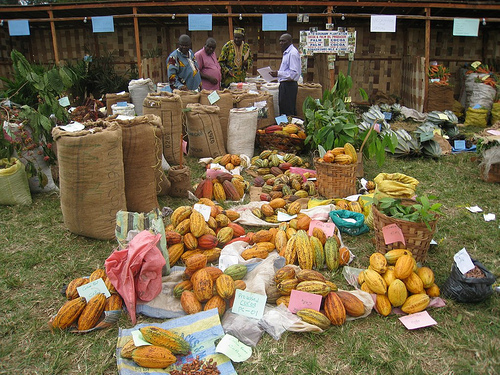 Almost 70% of the world’s cocoa comes from just 2 countries – the Ivory Coast and Ghana (Source: WCF). Up to 200,000 child slave laborers work on West African cocoa farms (Source: Intl Labor Rights Forum.) I’m not talking about children working on their family farms, but about kids, aged 8 – 14 who are trafficked from neighboring countries and brought to these farms. Kids handling machetes, breathing chemical fertilizers, working long hours, paid nothing. Their pain is our pleasure. How is this OK? The companies that control the supply of cocoa from West Africa: ADM, Cargill, Barry-Callebaut, Nestle). The largest purchasers of this cocoa? Hershey’s, Mars, Cadbury’s, Kraft. The dilemma here is that I don’t wish to see cocoa farmers in these two countries go out of business. Cocoa is their livelihood. I want them to be paid more so they don’t cut down cocoa pods that aren’t ripened yet in order to receive their wages. I want them to not have to resort to child labor because demand is so high for cheap chocolate, and this is the source for most of the world’s consumption. Chocolate companies are also limited in their ability to solely address this matter as they don’t own the cocoa farms, so it is necessary to work with the countries’ (often corrupt) governments on how to eliminate forced child labor and work with local communities and organizations to improve the livelihoods of cocoa farmers. That said, the large companies exert considerable control over prices and can push for more ethical working conditions through their intermediaries, and, the problem is complex. It requires sincere efforts by the governments of the Ivory Coast to channel more funds to the farmers and to education. To read more on slavery’s link to cocoa in the Ivory Coast, go here. In the U.S., The Harkin-Engel Protocol was passed in 2001 in an effort to push the industry to work together to eliminate the worst forms of child labor, in accordance with Intl Labor Organization standards. Problem is, the protocol was initially a mandate, and was fought by the industry and thus watered down to be voluntary – to date, deadlines to certify products and wean off child labor cocoa have not been met or adequately reported on. Many argue the ICI‘s efforts should be strengthened. Being aware of the issues is a first step in deciding what chocolate company to support. There isn’t one clear solution (although one that I do promote is supporting companies that are transparent and fair). On one side, you have Global Exchange, the ILO, and Equal Exchange advocating for more transparency and more pressure on the large cocoa companies. Then you have the World Cocoa Foundation and the International Cocoa Organization working directly with the largest chocolate companies to address these complex issues around the sustainable production of cocoa, issues of slave labor, poverty, deforestation, and livelihoods. Change is occurring, and while I continue investigating this change, I see no other option but to contact companies to push for change, and to choose companies that are open about their value chain. Stay tuned for a post on consumer tools for education and action. Clifford, Cassandra. (Oct, 2011) The Child Slavery Behind Your Chocolate. The Netherlands Aid. North, Rodney. (Sept, 2011) Child Labor in the Cocoa Industry. Equal Exchange. Parenti, Christian. (2008) Chocolate’s Bittersweet Economy, CNN Money. Interesting to learn about the Harkin-Engel Protocol. When we visited Theo this past Spring, I remember watching the film, The Dark Side of Chocolate and being disgusted by the harsh realities of child labor and abuse in the industry. I would happily support a protest or campaign against the big chocolate companies. You provide the numbers & addresses, I will start my letter! Monali, this is a great introduction into why we should care about the source of our chocolate. And, I can’t wait for your next post to tell me how I know which chocolate is “better” than others where social and environmental concerns are. I admit, I do enjoy some of the “lower quality, cheap” chocolate from larger brands. In what ways might we shift these larger brands to “better” sourcing? Monali, this is such a thoughtful explanation of the cocoa marketplace. I had an idea of what was happening, but I appreciate the detailed account you have provided. My initial avoidance of “big brand” chocolate years ago related more to unhealthy ingredients and preservatives (yet another cost-cutting measure they employ). I feel empowered knowing more about where my chocolate comes from and my ability to share this message with others to help increase awareness. Thank you MaryAnn! You’re not wrong on the health issue related to mass market chocolate. I have a draft in progress for that post. I’m so glad this post was helpful to you. It is great to hear that change is occuring and I assert that these changes will gain futher momentum in the future. One key stakeholder in this equation of being fair to the local farmers, abolishing child labor, and fighting corruption is the consumer. The consumer can exert the correct amount of pressure on corporations, through its purchase decisions, to do the right thing. We can reach out to the consumer through social media. Increasing awareness will also go a long way.